Successfully Added 7 Inch 2 DIN Car Stereo - Universal Fitting, Android 7.1, HD Display, 4 Core CPU, 2GB RAM, GPS, Android Maps Support, Bluetooth to your Shopping Cart. This universal 2 DIN car stereo system is compatible with many vehicles and straight forward to fit. Powered by Android 7.1.1 this in-car entertainment hub brings you movies, music, apps, and games. With Android Nougat in your car, you'll never be bored again. Featuring a large 7-inch display that boasts 1024x600 HD resolutions this double DIN car media player brings great visuals. This high-quality display is great for viewing your route or entertaining your passengers with movies and games. Supporting RCA video and audio outputs you can hook it up to headrest monitors to keep everyone on board entertained throughout your journey. Ideal for distracting your kids on those long run outs or the school run. Additional ports let you connect a rear parking or backup camera and also support micro SD and USB media inputs. With a powerful quad-core Rockchip CPU and 2GB of RAM as well as the Power VR G6110 GPU this Android car stereo is well endowed for playing media of every time. Having Bluetooth connectivity lets you sync your iOS or Android phone to the in-dash media player and enjoy hands-free calls and music streaming from your mobile device. 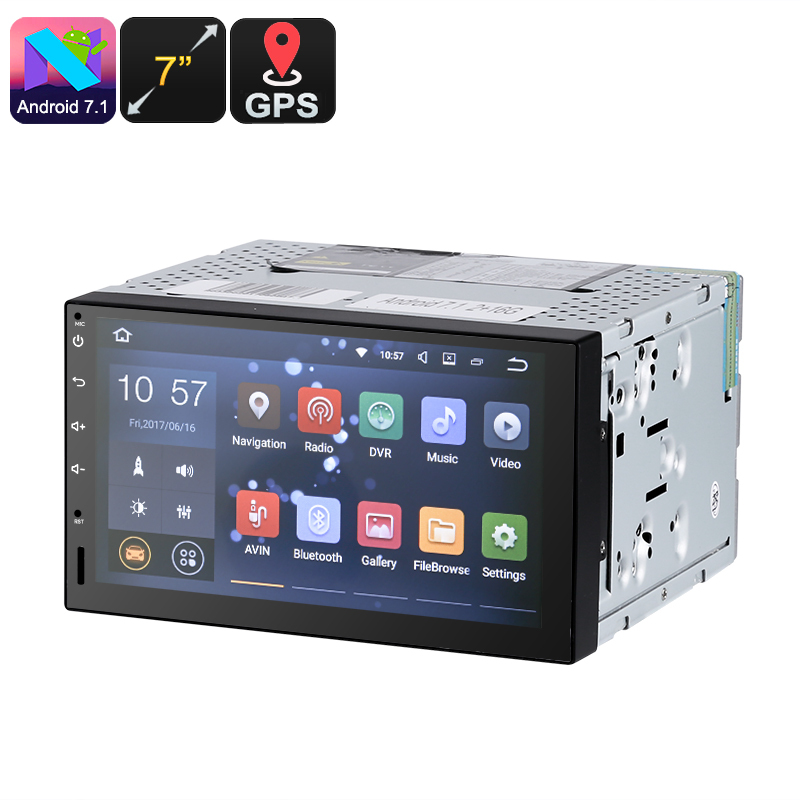 Equipped with a state of the art GPS receiver and supporting Android maps this car GPS system will improve your driving experience. By guiding you to your destination via the most efficient route this car GPS system takes the stress our of driving and means you can keep your attention on the road rather than worrying about what turnoff you need. The voice navigation will give you timely reminders of every turn on your route so you can enjoy the journey without stressing. Whether you're wanting a flashy 2 DIN car stereo to impress your friends or a large screen GPS for easier navigation this in-dash car media player has it all covered. This 2 DIN car stereo comes with 12 months warranty, brought to you by the leader in electronic devices as well as wholesale car stereos and car entertainment systems..